*Formerly published as Blaike: Secrets Gone Askew. I really enjoyed this story. It was filled with drama, love, danger, and so much more. Blaike and Oliver had an interesting time and I loved that I was able to be a fly on the wall in their story. The narrator does great things as well with each characters voice. Lottie is a hoot and gave such a laugh throughout the story. I would definitely recommend this book! I certainly love this story! To fall in love with someone who is secretly in love with you as well is soooooo romantic.. I definitely swoon over this romance! and the epilogue.. oh my is all I can say. This was a captivating story from the beginning. Blaike and her twin, Blaire are finding their way back home from their finishing school. They run into difficulties and can see no way out of their troubles. This story reinforces the strong family relationship. Captain Oliver Whitehouse, at odds with his father and an enemy to content with, has strong feelings for Blaike but knows he is unworthy. I loved how strong and brave Blaike was and the growing relationship between Blaike and Oliver. This a story that has romance, danger and a loving family. Stevie Zimmerman used a variety of voices for the characters, including a realistic one for the cockatoo. This brought the scenes to life. This was a thoroughly enjoyable story that I can recommend. Fabulous!! 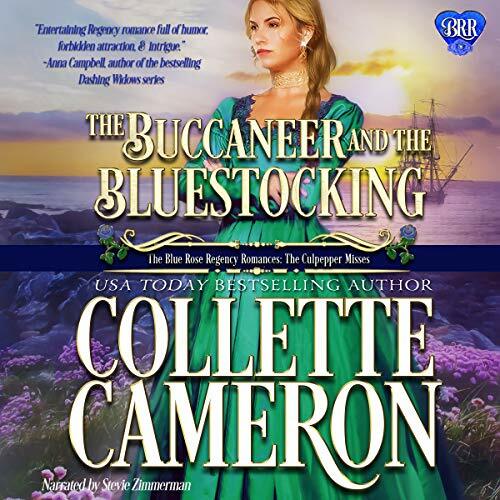 I have just started listening to audiobook and I am so loving them especially The Buccaneer and the Bluestocking written by Collette Cameron, book 4 in the Conundrums Of The Misses Culpepper series and narrated by Stevie Zimmerman who has such an amazing and beautiful British voice that it made me melt. This is one funny stories. Collette has created such delightful characters and this story is an original. The Buccaneer and the Bluestocking held me captive from the beginning until the end. This story has a wonderful cockatoo with a very colorful vocabulary, evil, twins, deception, sailing across the ocean, a storm, kindness, unspoken feelings, family love, a secret, a chase, shame, scandal, schemes, compromised, death, assassin, injury, healing, fires, pride, true friendships, misunderstandings, forgiveness, a difference in station and love! What a great story! I highly recommend The Buccaneer and the Bluestocking , you won’t be disappointed. Sail across the ocean in 1823 on the Sea Gypsy with Captain Oliver Whitehouse, Ladies Blaike and Blaire Culpepper and the cockatoo, M’Lady Lottie and the beautiful voice of Stevie Zimmerman. ***This audiobook was gifted to me and I am voluntarily reviewing. I have to say this is one of my favorites from the inappropriate parrot to the Italian speaking Oliver, swoonworthy. The narrator did a fabulous job. Add in the suspense and romance. Bueno. I received a complimentary audio and this review is voluntary. Collette sure knows how to write and Stevie’s narration of it brought it to life. I so enjoyed the adventure of Blaike and Oliver. A great love story with plenty of adventure. The cockatoo cracked me up. I laughed so hard at that bird. Don’t miss this one. As Blaike and Blair attempt to escape a rather unsavory event at their 'finishing school' and an even more unsavory attempt to kidnap them to be sold in the Eastern slave markets, to their rescue comes Captain Oliver Whitehouse, a man with problems of his own. Oliver is a family friend and he and Blaike have feelings for each other. He 'knows' nothing can come from it. She's not so sure. Which one of them is right? Stevie Zimmerman does a wonderful job narrating the fourth story in the entertaining Culpepper Misses series. This is a wonderful series and Blaike's story does not disappoint. Danger, adventure, secrets, forgiveness, and a search for belonging and love will keep you glued to this story. There are some very interesting twists and turns in this one. There is also M'lady Lottie, a scene-stealing, attention-seeking, foul-mouthed former brothel-dwelling cockatoo Oliver inherited from an old captain. You'll love her.